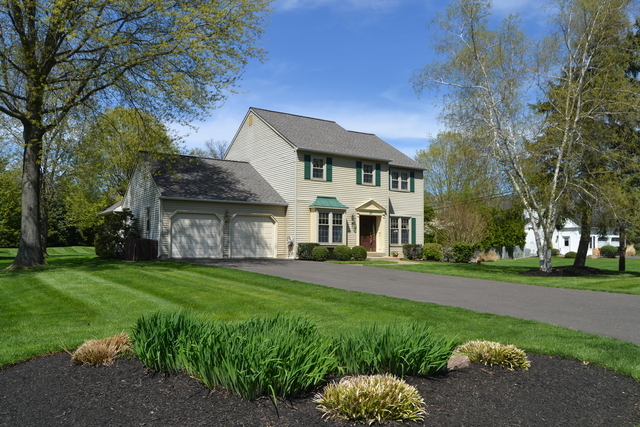 Welcome home to this absolutely beautiful, completely updated, first time offered, two story Colonial in Churchville. Lovingly maintained and upgraded by the original owners, this 4 bedroom, 2.5 bath home is impeccable throughout and in immaculate move in condition. Sited on a beautifully manicured parcel, it is spacious, comfortable and offers ample indoor and outdoor living space. From the gracious foyer entry, you will notice the gleaming hardwood floors. The first floor features a formal living room, formal dining room, family room with brick fireplace and sliding doors to a phenomenal covered patio, giant great room with cathedral ceiling and wall of windows and patio doors as well. The stunning kitchen is reminiscent of kitchens found in houses at twice the price. Only 3 years old and neutral in color, it features gorgeous cabinets to the ceiling, GE Café Line stainless steel appliances, granite counters, tile backsplash, undermount sink, under cabinet lighting and more. Extra large laundry room and powder room complete the first floor. Upstairs is the master bedroom and bath with newer tub, three additional bright and airy bedrooms sharing a beautiful hall bath with double vanity. The unfinished lower level is dry as a whistle and offers endless possibilities for adding your personal design and finishing touch. The view from the covered patio is picture perfect – with its lush lawn, gorgeous trees and pines. All beds have been mulched and trimmed. One Year Home Warranty is included. Upgraded within the last five years: New Roof, New Heater / AC, New Water Heater, New Well Tank, New Spectacular Kitchen, New Hardwood Floors, New Windows, New Driveway, New Front Paver Walkway, New Garage Doors, New Sliding Doors to Patio, New Washer and Dryer just one year old and included. Please note: correct utilities are Public Sewer, Well Water. Propane is for Gas Cooking, Dryer and Fireplace insert ( can be returned to woodburning ).